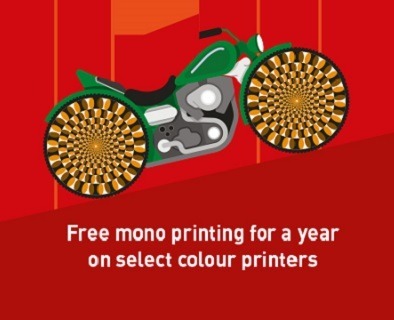 OKI Europe Ltd is offering businesses free mono printing for a year when they purchase an eligible device from OKI’s comprehensive portfolio of advanced colour and mono office printers and multifunction printers (MFPs) between 1st October and 31st December 2017. The “Maximum colour, zero mono cost” offer covers some of the most innovative LED colour printers and multifunction printers on the market, putting cost-effective professional quality printing within the reach of every business. Designed to print mono at the same cost as a purely mono printer, these devices mean a business can meet all its workload requirements with a single versatile printer or MFP, while keeping costs firmly under control. Included in the promotion are OKI’s ground-breaking C332dn, MC363dn, C500 Series, MC500 series, C800 Series and MC800 Series. These are highly advanced devices packed with functionality and improved connectivity that print mono or vibrant, vivid, pin-sharp colour on everything from business cards to banners, promotional point-of-sale materials and customer facing documents. “With free mono printing for an entire year, this limited time offer makes OKI’s unbeatable range of function-packed colour printers and MFPs for the office even more irresistible,” said Tetsuya Kuri, Vice President Marketing, OKI Europe. The promotion is available on printers bought between 1st October and 31st December, 2017 and allows customers to claim free mono toner with the purchase of a C332dn, C500 Series, C800 series printer or a MC363dn, MC500 Series or MC800 Series MFP.